Here’s something I never thought would be true—I missed half of Lake Street Dive’s set because I had to get home to meet our babysitter. Really. Lake Street Dive’s kind publicist offered me a plus one ticket to the show, and my sweetie and I asked my awesome student Lauren to babysit his two kiddos—the first time we’ve gone out together on a Saturday night since we started dating. Lauren met up with us earlier in the day so we could introduce her to the boys, and from that moment on, Jeff’s oldest asked “when is Lauren coming” every twenty minutes for the rest of the day! Adorable! I nearly forgot that Lauren couldn’t drive past midnight (driving laws these days are so different than when I was in high school), so we had to leave at 11 to get home to her in time. Here is a public declaration of thanks to the fabulous Tom Rota, outgoing Programming Director of my favorite intimate listening room anywhere—Portland’s One Longfellow Square. It was Tom who introduced me to Lake Street Dive back in 2011. I saw them at OLS in 2011 and 2012 play to pretty full houses—almost 200 seats in the house. Here’s my post from their October 2012 show. To see them play to a sold out crowd of nearly ten times that amount of people at State Theatre just over a year later was incredible. Lake Street Dive is getting the attention they truly deserve. It’s funny to see them called a “new” band since they’ve been together since 2009, but I’m happy people are catching on and am lucky to have gotten to know them early on. From my post in 2012–I love Rachael’s face in this one! Try getting a picture of Bridget who is constantly in motion! There’s Mike Olson, too. I love this shot from 2012 at One Longfellow Square! I had to get up and walk to the back of the room to fit all of LSD into one frame. 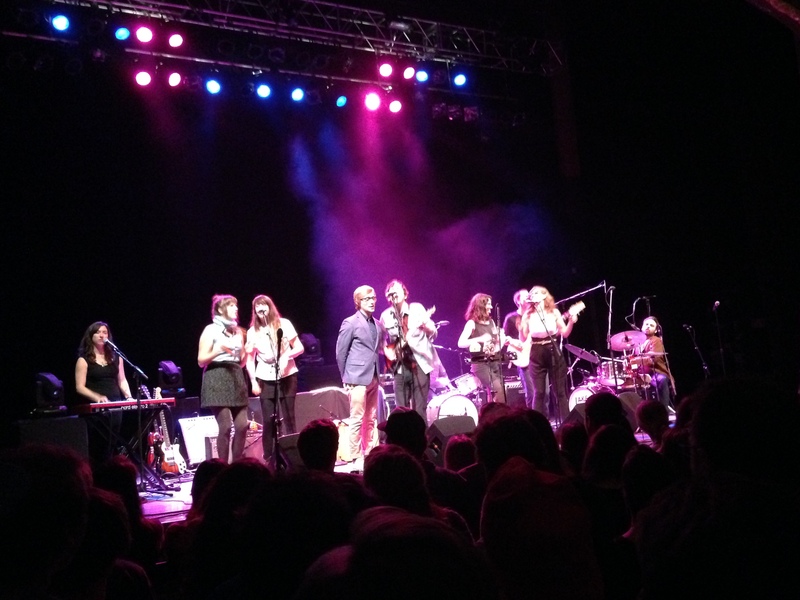 Portland, Oregon’s Ages and Ages opened the show and reminded me of The Partridge Family. All six band members sang and played percussion at some point during their set. 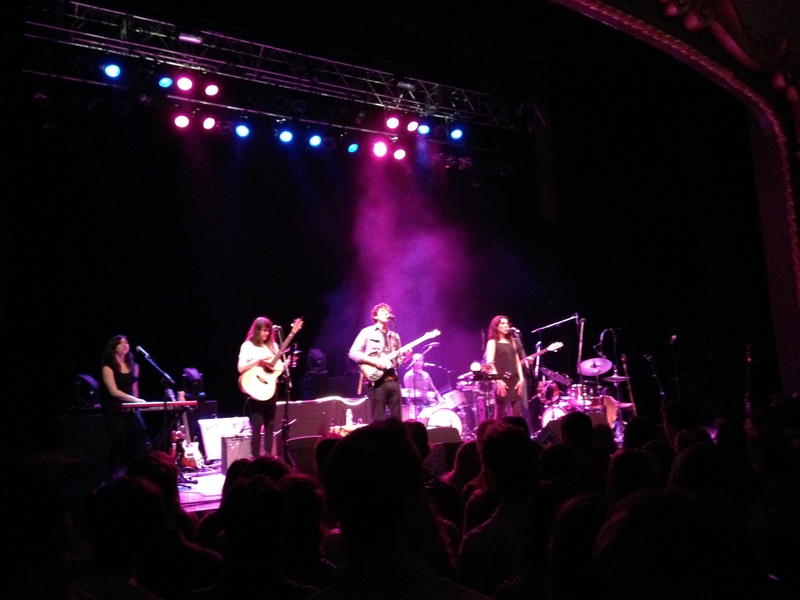 Their upbeat harmonic pop sound was full and energizing. When the tambourine came out, Up with People came to mind. Their hopeful songs like “I See More” promised “It’s all OK, I’ll be on your side.” Mike Calabrese from Lake Street Dive joined Ages and Ages on drums for their last song, “Divisionary,” and we were happily surprised when the rest of Lake Street Dive came out to join him, too. There was an excruciatingly long break between bands, and I started to realize that we’d have to leave the show early because of that. Boo. Luckily, Steve Feeney wrote this show review for the Portland Press Herald so I could read about what I missed—including a sing along cover of “Rich Girl” to end the evening. The State was packed and people were jockeying for a place to stand around us near the front—a far cry from the last times I’ve seen LSD play in teeny listening rooms to seated small audiences. The show was originally supposed to be at Port City Music Hall, but after shout outs in Rolling Stone and The New Yorker, multiple late night show appearances, and the successful release of their acclaimed newest album Bad Self Portraits, the move to State Theatre was made and the show sold out. Awesome. 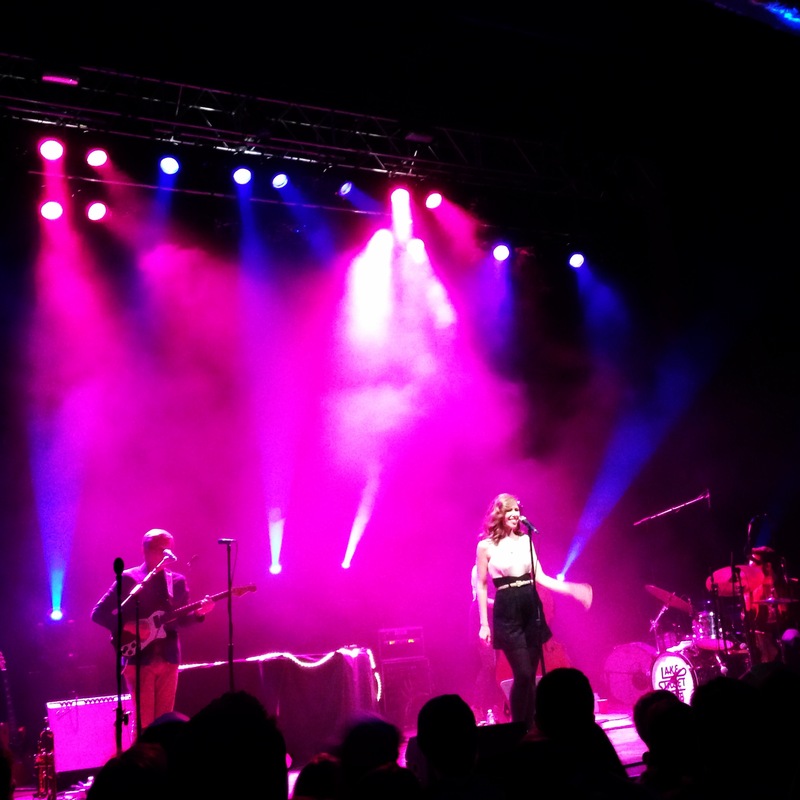 Lake Street Dive’s lead singer, the incomparable Rachael Price, was a showstopper, but absolutely humble and genuinely grateful for the warm reception they received. She welcomed us to “the biggest show we’ve ever done,” and she seemed stunned by our presence as we surely were by hers. She was buoyed by the enthusiastic crowd and told us that they were at the end of a long tour and we were lifting them up. I love it when a band shows appreciation for the audience. A little friendly banter goes a very long way in my book and can make or break a concert experience. Rachael Price, Mike Calabrese, Bridget Kearney, and Mike Olson met almost a decade ago as classmates at Boston’s New England Conservatory and have been together ever since. One of the many things I love about this insanely talented jazzy pop group is that each is a star in their own right. Rachael is the most obvious talent because she leads with breathtaking vocals, but everyone is an integral part of this perfect puzzle. Bridget’s bass is full and mesmerizing. Mike Olson’s trumpet parts feel like they have their own voice. Mike Calabrese knows how to showcase everyone and when to pick it up or slow it down on drums for the greatest impact. They are a true team. Bridget had a sick solo on “Henrietta” and Rachael told us Bridget wrote “Love Doctor” as well. Bridget seems to be the head writer for the group these days. Their producer, Sam Kassirer, joined them onstage for a few songs on the keys. He owns and operates The Great North Sound Society in isolated Parsonfield, Maine—so there’s a Maine connection to Lake Street Dive’snew album, which was recorded there. 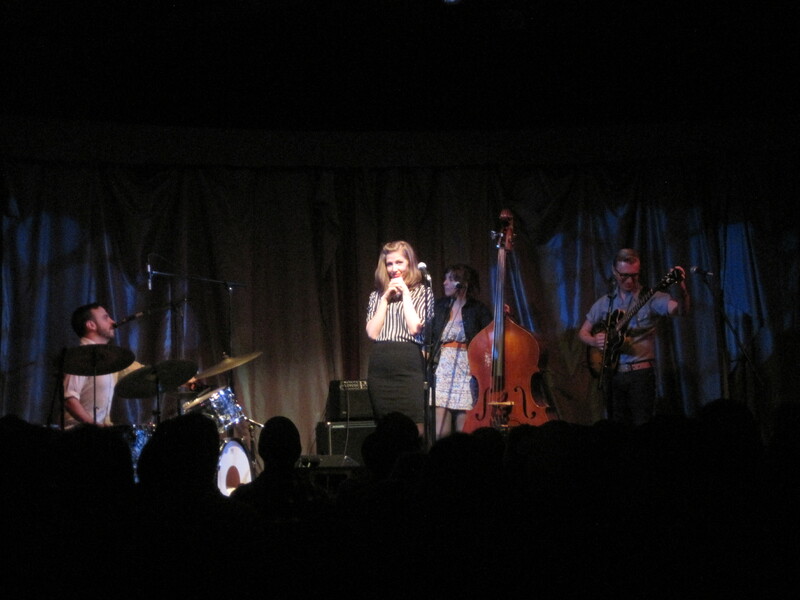 I am so happy you were all there to see Lake Street Dive live. What a treat. Lake Street Dive posted a picture and a thank you to the sold out crowd on Facebook and I’ve rarely seen so many likes and comments on a post in such short time. 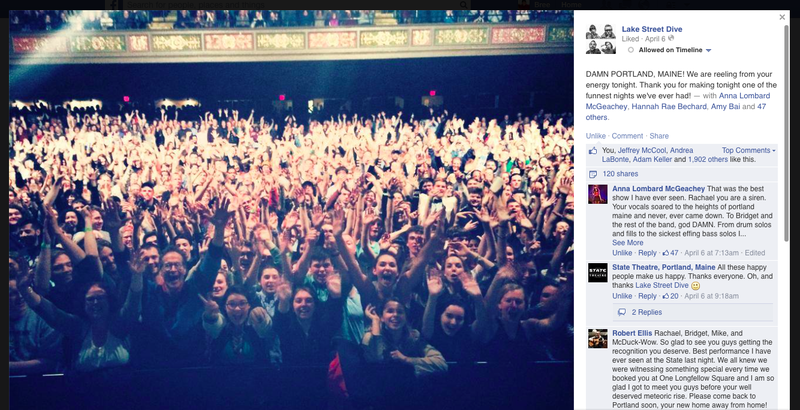 Lake Street Dive showing Portland, Maine some love on Facebook! 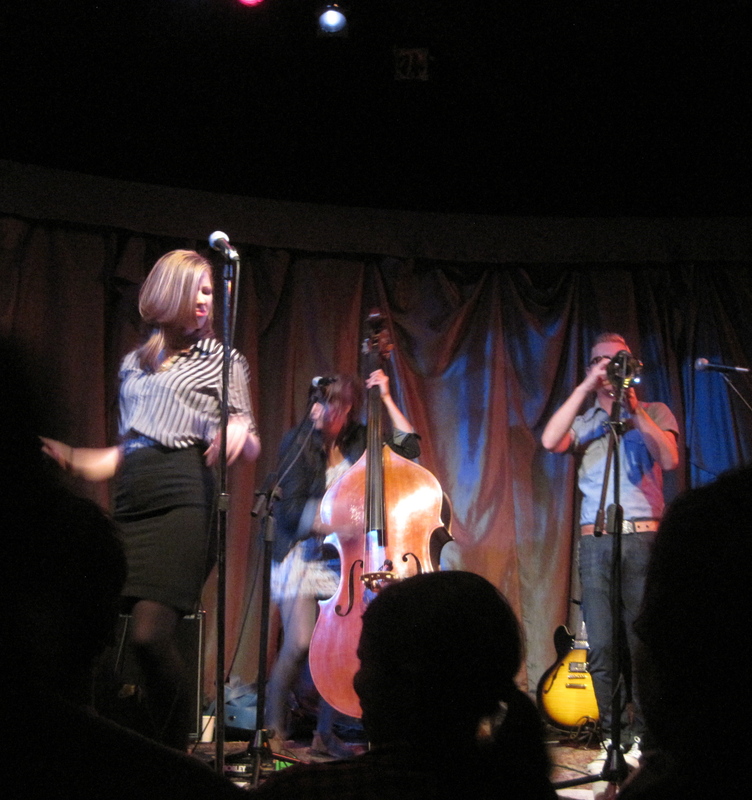 Whatever it was that introduced you to Lake Street Dive—Kevin Bacon’s tweet with a link of their cover of “I Want You Back” (which has almost two million views now), their appearances on The Colbert Report, The Ellen Degeneres Show, and The Late Show with David Letterman, or even just that Portland’s 98.9 WCLZ made their song the free download of the week a month or so ago, welcome to the fan club! To quote David Letterman after their performance on his show—“Are you kidding me? Come back every night. Can you do that?” Perfectly said, Dave. I’m sure I speak for everyone at the show when I say that I hope you’ll come back soon to see us again! 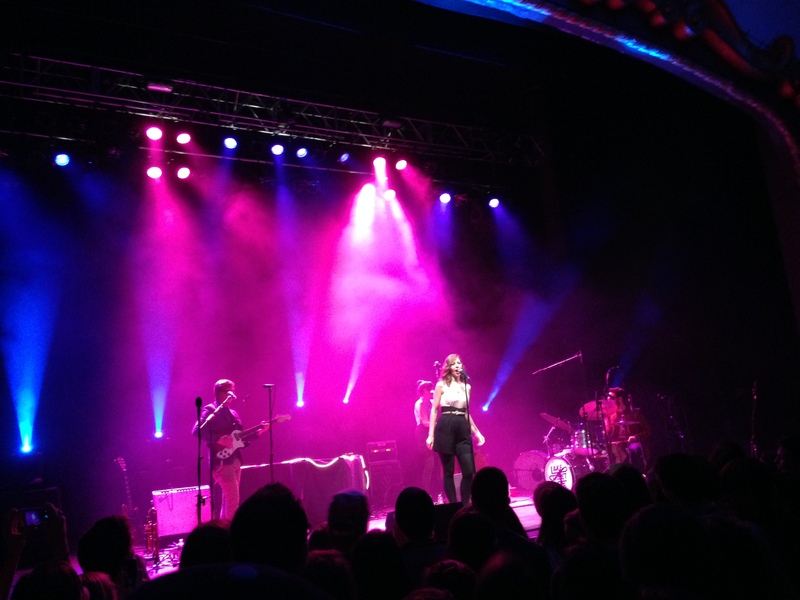 Thanks, Lake Street Dive! 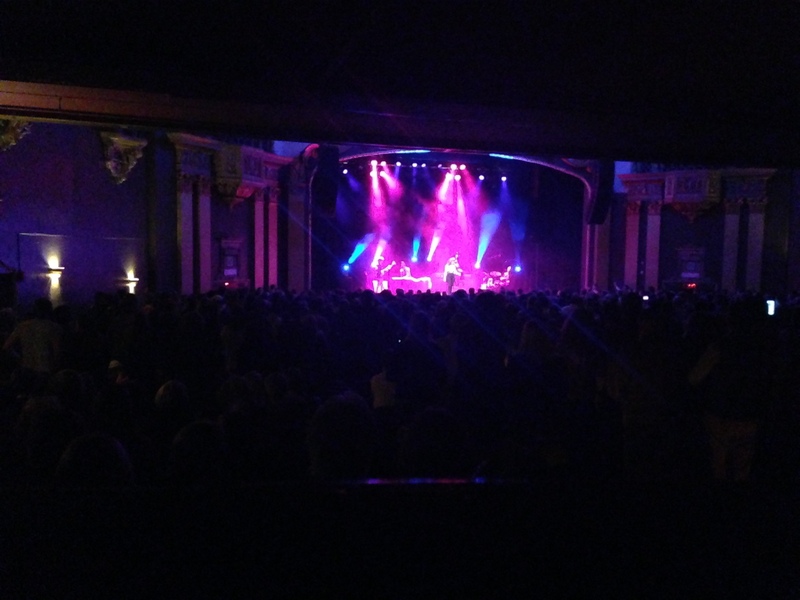 A packed State Theatre crowd. So sad to have to leave early!